Demystifying the classic chicken Provencal and it’s swanky-sounding cousin, chicken Veronique. Photographs by anthony tieuli; food styling by Sheila jarnes/Ennis inc. In the days before Julia Child popularized French cooking in American kitchens, some dishes intimidated cooks with names that sounded foreign and fancy. We’ve come a long way since then, and we get that learning a few core cooking techniques is the key to countless exotic-sounding dishes — French and otherwise. Classic chicken Provencal, for instance, is but a humble braise flavored with onion, garlic, herbs, anchovies, tomatoes, and olives. Likewise, swanky-sounding chicken Veronique is really just sauteed chicken cloaked in a pan sauce flavored with wine, cream, and grapes — a textbook case of cooking that’s easier than the name would lead you to believe. This is a saucy dish, so serve something alongside to help soak it up, like polenta, roasted potatoes, warm chickpeas, or chunks of baguette. Both the anchovies and olives give the dish plenty of salt, so season it conservatively at first, then taste and adjust as needed. 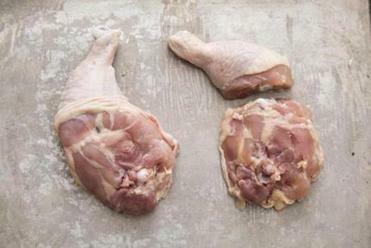 TIP: Cutting the thigh and drumstick through the joint isn’t hard. Just use the slender line of fat between them to guide your knife. In a large, straight-sided saute pan over medium-high heat, heat the oil until shimmering. Sprinkle the chicken all over with salt and black pepper, arrange the pieces skin side down in the skillet (do not crowd — work in batches if necessary), and cook, undisturbed, until skin is crisp and golden brown, about 5 minutes. Turn the chicken and continue to cook, undisturbed and adjusting the heat as needed, until the second side is golden brown, about 5 minutes longer. Transfer the chicken to a large plate and, when cool enough to handle, remove and discard the skin. Remove all but 1½ tablespoons of fat from the skillet. Adjust heat under the pan to medium, add the onion and ½ teaspoon salt, and cook, stirring, until softened, about 4 minutes. Add garlic, red pepper flakes, herbes de Provence, thyme, anchovies, and tomato paste and cook, stirring constantly, until fragrant and the tomato paste begins to film the bottom of the skillet, about 1½ minutes. Add the flour and continue to cook, stirring constantly, about 1 minute. Add the wine, adjust the heat to medium-high, and bring to a strong simmer, scraping skillet with a wooden spoon to dissolve the fond, about 1 minute. Add the broth and tomatoes and bring to a simmer, stirring to incorporate. Add the chicken with its accumulated juices and return to simmer. Adjust the heat to low, cover the skillet, and simmer gently until the chicken is cooked through and tender, about 35 minutes, turning the chicken over after 20 minutes. Remove the chicken to a serving platter, tent loosely with foil, and set aside. 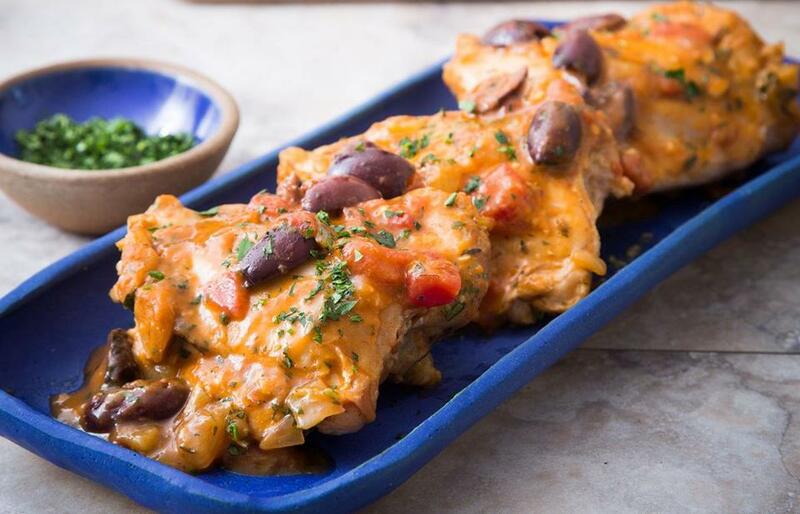 Adjust the heat to medium-high and simmer the sauce, stirring, to reduce slightly, about 5 minutes, adding the olives and any accumulated juices from the chicken halfway through. Taste and adjust the seasoning with salt and black pepper. Stir in most of the parsley. Pour the sauce over the chicken, sprinkle with the remaining parsley, and serve at once. Bell peppers and paprika often characterize dishes from the Basque region, including this one. If you happen to have some dried piment d’Espelette, a fruity, mildly hot chili used in France, use about ½ teaspoon of it in place of the crushed red pepper flakes. 1) Along with the onion, saute 1 large red bell pepper and 1 large cubanelle pepper, each cored, seeded, and cut into ¾-inch pieces. 2) Increase the crushed red pepper flakes to ¼ teaspoon, substitute 1½ teaspoons paprika for the herbes de Provence, and decrease the thyme to 1 teaspoon. 3) Omit the anchovies and olives. Sauce Veronique, classically paired with chicken and fillet of sole, is made with seedless grapes, which give it a delicate sweetness. In a large bowl, mix 1/3 cup salt, the sugar, and 6 cups water, stirring to dissolve the salt and sugar. Submerge the chicken, cover and refrigerate for 1 hour. Rinse the chicken and dry well. In a large nonstick skillet over medium-high heat, heat oil until shimmering. Add the chicken and cook, undisturbed, until bottom is lightly browned, about 2 minutes. Turn and cook until the second side is lightly browned, for about 2 minutes more, then remove and set aside. Adjust heat to medium-low, add the butter and allow it to melt, swirling the pan to coat. Add the shallots, thyme, and ½ teaspoon salt and cook, stirring constantly, until shallots soften, about 2 minutes. Add the garlic and flour and cook, stirring, until fragrant and the flour films the cooking surface, about 40 seconds. Add the wine and, using a wooden spoon, scrape the pan to dissolve the fond, about 15 seconds. Continue to cook, stirring, until thickened, about 1 minute longer. Add the broth, return to a simmer, and continue to cook, stirring, for about 2 minutes. Return the chicken and any accumulated juices to the skillet, cover, and cook, undisturbed, until chicken registers about 155 degrees on an instant-read thermometer, 6 to 12 minutes. Remove the chicken to a serving platter, tent loosely with foil, and set aside. Add the cream to the skillet, adjust heat to medium-high, bring to a strong simmer and cook, stirring constantly, until slightly reduced and thickened, about 2 minutes. Add the grapes and continue to cook, stirring, until they are just heated through, about 1 minute longer. Off heat, add the lemon juice and any accumulated chicken juices and stir to incorporate. Taste and adjust the seasoning with salt and pepper. Stir in most of the parsley. Pour the sauce over the chicken, sprinkle with the remaining parsley, and serve at once.